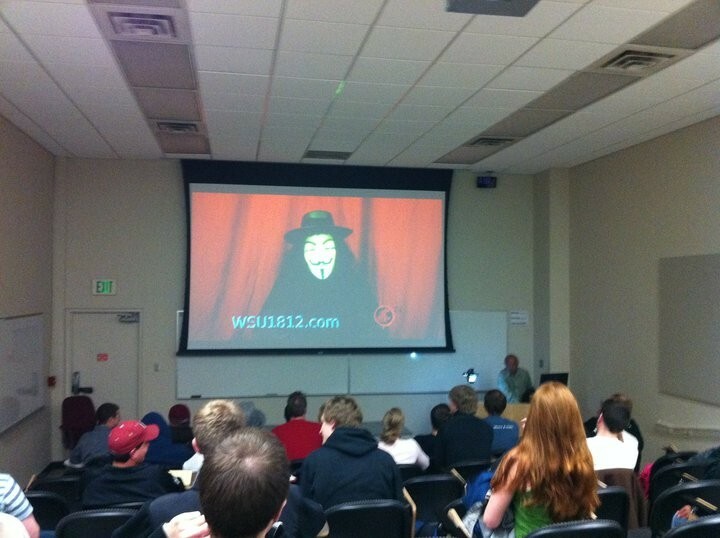 In honor of today's Guy Fawkes Day (or, more accurately, the movie V for Vendetta) some enterprising WSU students apparently hacked into the computer system and broadcast a message in several different buildings on campus, using the overhead projectors. The image at right was taken by WSU student Mike Bjork and posted on Facebook. The caption to the photo read, "And the professor was totally helpless." The "movement" is calling itself WSU1812, apparently in reference to the 1812 Overture, which was played during the penultimate scene of V for Vendetta. The group's website details a list of (mostly minor) complaints, largely about issues relating to technology. It's unclear if the movement is intended to be serious or not, but I guess it's always nice to be reminded of a 4-year-old bad-comic-book-adaptation movie starring a mostly bald Natalie Portman. UPDATE: According to Darin Watkins, WSU's director of external communications, it appears the video has been stymied. It only affected select classrooms in two buildings on campus that had a certain multimedia system. Some WSU classes have an integrated system that controls a computer, various input devices and the projector screen — apparently, whoever was behind this hijacked the system to lower the screen and play the video without warning. Watkins says a team from Information Services will be working "through the weekend" to make sure the classrooms will be functional by Monday. "It rendered the systems inoperable — at what level, I'm not sure, but they're going to take some considerable work," he says. He says the case is being handled by WSU Police, who are treating it very seriously. It's unclear what punishment could be meted out by the university if students were involved, but it doesn't sound good. "We consider this a serious breach of our systems, and we will treat it as such," says Tom Ambrosi, chief information security officer for WSU. The video also caused some consternation among instructor. Watkins relayed the tale of one instructor who, after seeing the video come up during her class, went on the Internet to find out more about the video. After she learned he was connected to an attempted bombing of Parliament, "she was very worried," he says. Update II: In an e-mail response from the address listed on the WSU 1812 site, "V" says the systems were completely functional except for the five minutes each hour when the video played. Additionally, he says, at 5 pm all modifications were automatically deleted. The site now has instructions at the bottom on how to remove the video if "[WSU] tampered with it," which involves running a single uninstall program. V went on to say that at no point "was the security or stability of any system compromised by my actions, rather this should alert them to security flaws and allow them to take the appropriate actions to correct these flaws before someone with malicious intentions strikes." MORNING HEADLINES: Wabbits, Murray, fightin' ... It's Friday!